The interior was a breeze, my cottage style garden, no problem, even my basement, strewn with kids' toys wasn't a challenge, but the front door? You see, I've always, always wanted a black front door. There's something about the drama and classic style that draws me in. So when we moved here, I thought, ok, here we go. But sadly, it didn't work out that way. I was so distraught, I chronicled the entire saga back in 2013 ~ the sad tale of a southern exposure and heat trapped between a storm and exterior door. And the terrible damage that occurred because of that marriage. Since then I've done nothing. 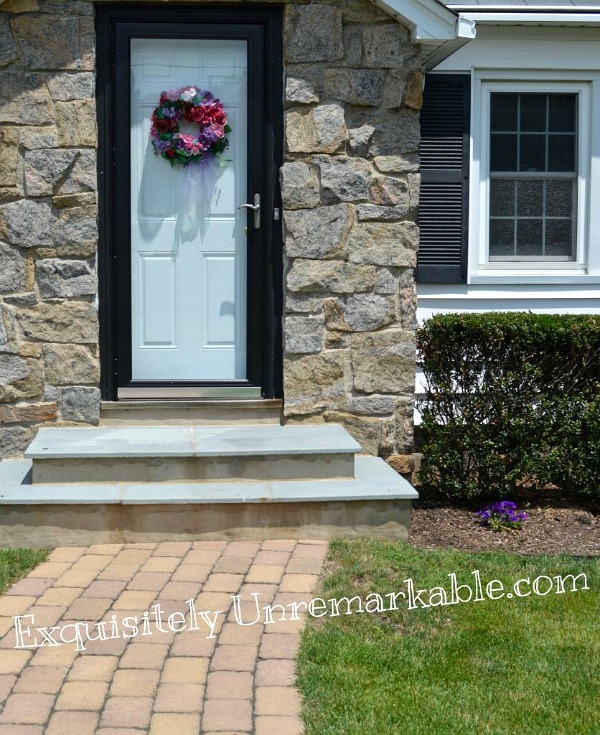 I wavered back and forth between keeping the storm door and ditching it and just about once a month I chose a new paint color, but when it came time to act, I was paralyzed. The black storm sat over the unpainted door and I grimaced every time I looked at it. 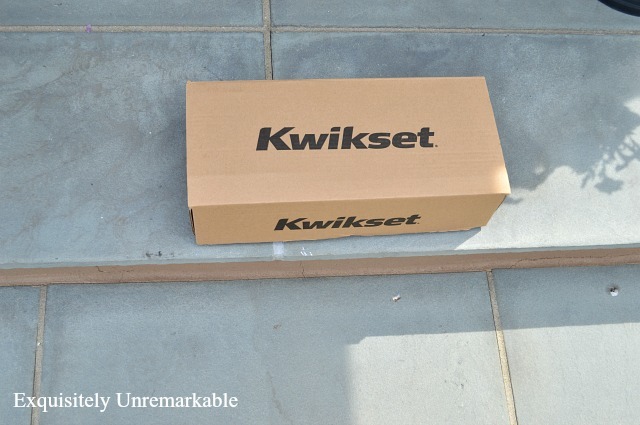 *Kwikset provided me with this beautiful handset, but all opinions expressed here are my very own. Somehow, it just didn't fit. Since the day we bought this house, I had a vision for this little cottage's curb appeal and I so far I hadn't been able to pull it together. My sweet beach bungalow had been frowning for far too long and something had to be done to bring it back to its clean and simple roots. 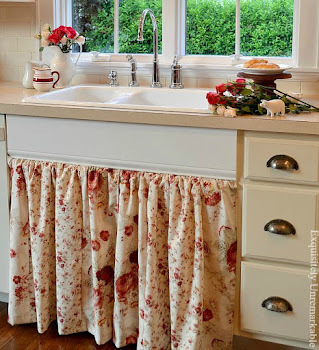 So, this summer, after way too many years of hemming and hawing and frankly, avoiding the topic altogether, we decided to tackle the dreaded front door. My husband started by replacing it with a new steel version, including the frame and saddle. While the design details were still fuzzy, it was a start. Unfortunately, that's as far as we got for a bit. Unsure about color and whether or not we wanted to put the storm door back, we left it alone. White and unpainted yet again. Then one day, after many drives around the neighborhood to peek at other entrances (real life provides the best inspiration! ), we decided to go with our guts and our original love and paint the door black. Of course, it meant we had to leave the storm door off, but in the end we decided it was the best route. The kids weren't babies anymore and we hardly ever opened it. So after a day of painting, certain we had made the right decision, we stood back to admire our fabulous new view and both said....hmmm. While the color of the door was right (Phew! That would be a tough one to paint over), it was very clear that something was missing. The majesty I expected my home to have, the cottage style charm I was certain it would now possess, that stop and look at me, wow drama factor...was all missing. And it was all because of the puny door knob. Hidden behind the storm, I never really noticed it before, but now it was on display, it was all wrong. Here I was focused on the color and I never even considered the most important accent on the door. This one would not do. That is when I started looking for a new handle and fell in love with a gorgeous satin nickel handset from Kwikset...The Ashfield. Sound familiar? It should it's the name of the beautiful faucet I recently put in my kitchen. At least I'm consistent. I was so excited, I couldn't wait for the box to arrive to put a little sparkle on my new front door. As usual, I was given the difficult job of holding things and getting water. The directions were very clear and the job was very quick...which was excellent since it was a ridiculously hot and humid day. The new handle looked absolutely outstanding and its classic style fit the house. It felt secure and strong and the key worked without a stutter. The satin nickel tone picked up the silver shades in the stones and added a bit of shine to the entryway. When we stood back to admire the view this time, it took our breath away. Totally gorgeous. A definite wow. More importantly, the outside of the house finally matches the inside of the house. Cottage style through and through. I've said it before and I'll say it again, the decorating devil truly is in the details. This handset made the entryway pop. It was the perfect finishing touch and I couldn't be happier with the choice. I am so glad we stuck with our original plan and painted the door black. Even if it did take us five years to commit. It was totally worth the wait. 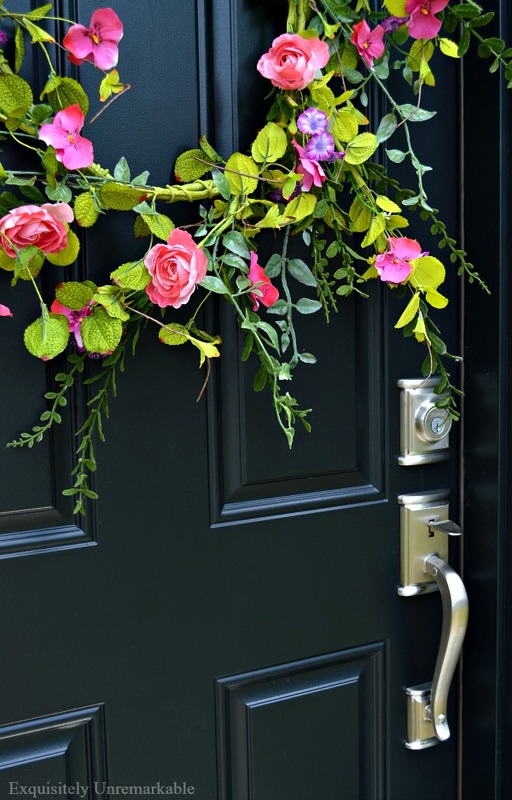 Is your front door fabulous? 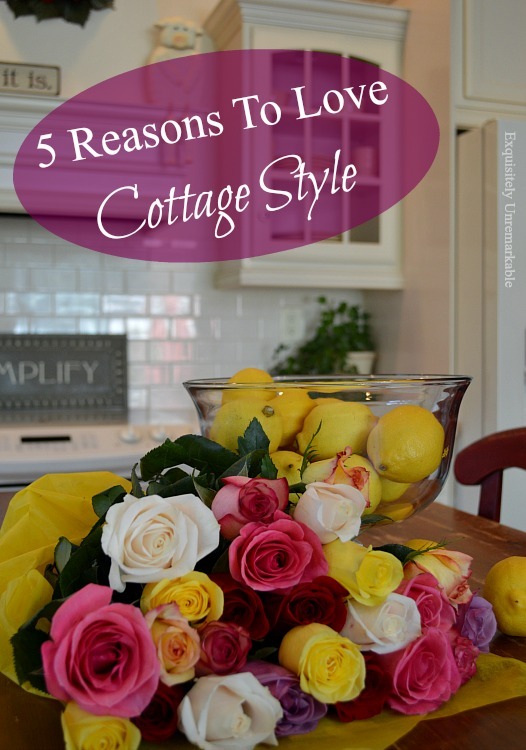 Looking for more cottage style flair? Love it! What paint did you use? Color? The black door and new handle looks beautiful! It makes your entry POP! Oh Kim this is a great re love. The new handle looks so beautiful on the black door. The black door with your stone is just gorgeous. I am swooning. What a difference!!! Love love love this. Thanks so much, Kris! It was a long time coming, but we love love love it now, too!! Hugs!! It looks quite spiffy! And I love the stone walls too. All I can say is WOW. The new color and yes the hardware just gives it a WOW factor. Thanks Betty! The handset really sets off the black paint. So lucky to have found such a perfect piece! Who knew a doorknob could make such a difference? It's lovely Kim & the black looks very classic & high end. It made all the difference in the world, Florence. It made the black paint pop!! And thanks...we love it! WOWZER! no other words needed really. it's gorgeous. 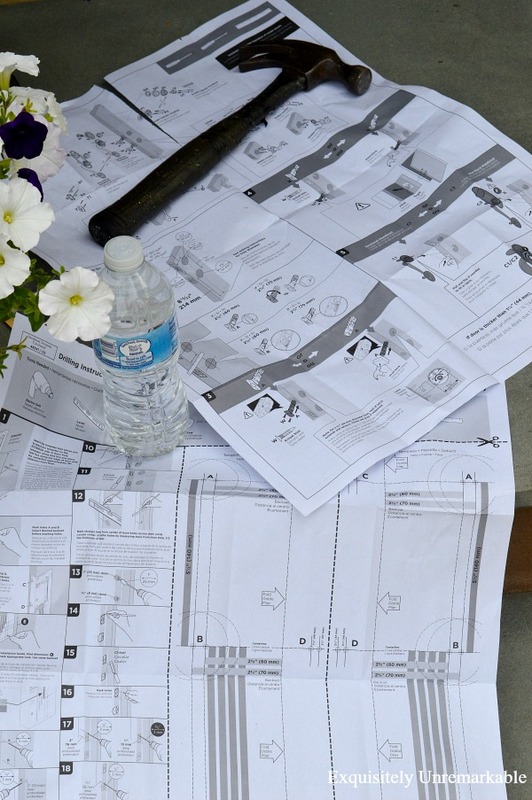 so is your husband for deciphering those instructions and doing it. and your wreath is beautiful on the dark door! WOWZER!! I love the word, Tammy!! Best compliment ever!! Thank you my friend. 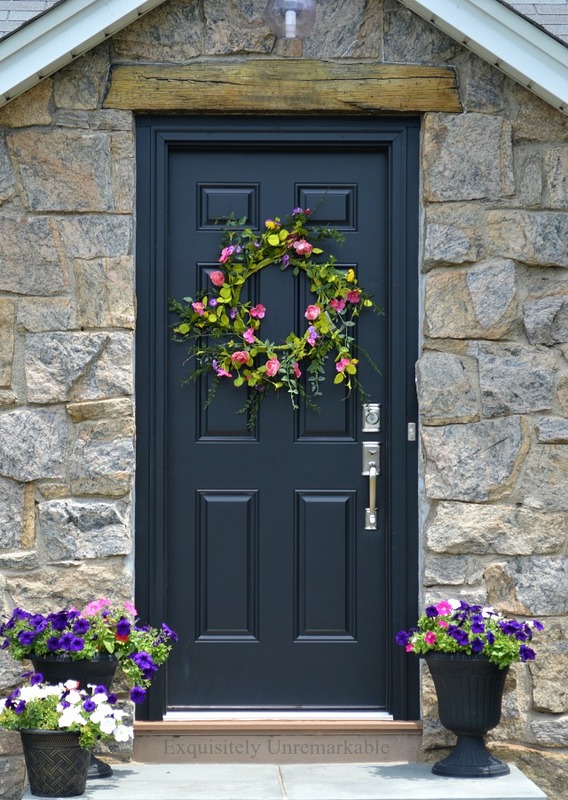 From the solid black, faux wreath, side colorful planters, to the stunning new door handle, lock . . . Thanks so much, Lynne. I have to say it's the bold and beautiful entryway now that this little cottage deserves. And copy away, please!! I absolutely love it! My door needs attention, but we have other house things to do first. I'm going to remember this! Thanks Mari! And I totally understand, this door was last on the list...for a lot of reasons! Ha! That is one gorgeous door and door knob! You have great taste! Thanks so much, Laurel! ❤️ That handle makes me look like a designing champ! It is perfect Kim. Absolutely perfect. Striking and elegant. Such good choices. Thanks so much, Lorri. It was definitely worth the wait. That said, I should’ve done it years ago! Ha! Kim, your door is stunning! I love everything about your entry now. Our front door is not very delightful. I would love a new one, and I'd love to paint it a pretty color. Thanks Ricki! Trust me it was not very delightful for a very, very long time!! You did good...love the door color and the handset! Amazing things happen when we take a step sideways and see things with a new perspective. Removing the storm door was the perfect solution for getting the door of your dreams. 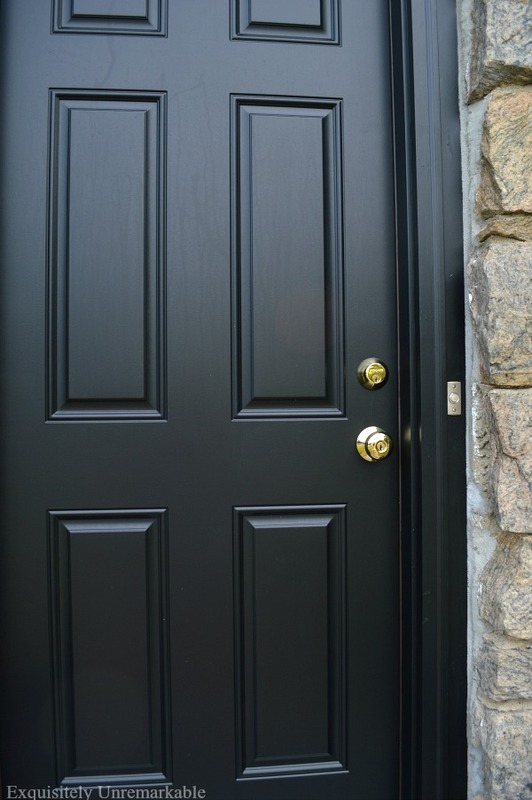 The black door with the stunning door handle set makes all the difference in your front door's appearance. Great choices! Judith, you are so right. I hung on to that storm door for the longest time and for all the wrong reasons. Ditching it was the perfect solution like you said. I should've stepped sideways years ago!! ☺️ Thanks for the visit and the super kind words! Thanks Diana! We should've done it years ago. And yes, that wooden header is a charmer, isn't it? The original light fixture is there, too. I think they really hold the beauty of the time the home was built. I think that wood is driftwood from our beach. I just love it, too. Elegant and beautiful ! Love ! Simple yet elegant ~ good job! Thanks Bobbie! I adore the wreath (and it was a bargain)...I just hope I can keep the plants alive. That's not my strong suit!! Thanks for the warm welcome, Stacey! I have been standing on the sidelines as an admirer for too long. I love your new black door and handle! So beautiful!! Thanks Penny! I really like looking at it. Your house is adorable. I love how something so simple can really make us love our homes more! Thanks Jenny!! I totally agree...a little paint, a little sparkle and boom, I'm in love all over again. 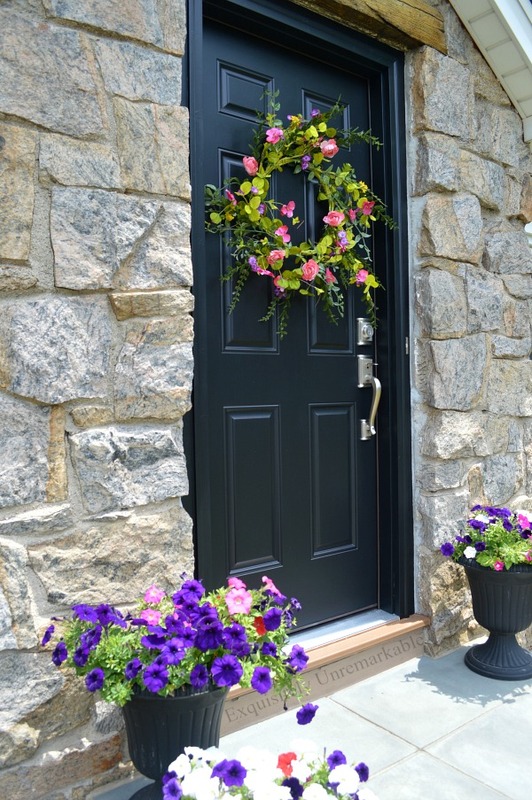 You're absolutely right to think your new door is fabulous--it is! Your whole entrance is stunning and the black is just the best ever with that beautiful stonework and the lintel overhead (is that the word for it?). And it would be ruined by a storm door. 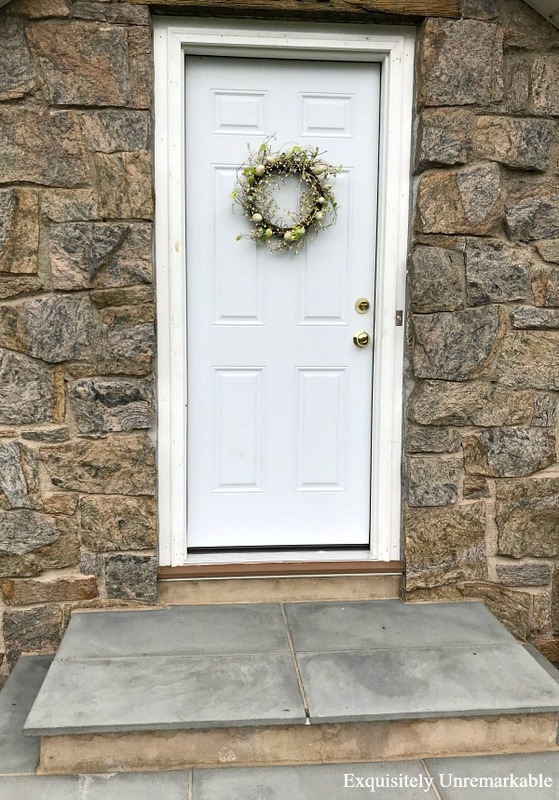 In our case we had to have one installed to bring some more light into the room, and a way for my doggies to look out on the world but no doubt about it, a storm door hides the beauty of a door. We painted our Benjamin Moore Fairfield Green and I love the color but it can't be seen much from the road because of the storm door. That new handle is beautiful, kind of the jewelry for the door. 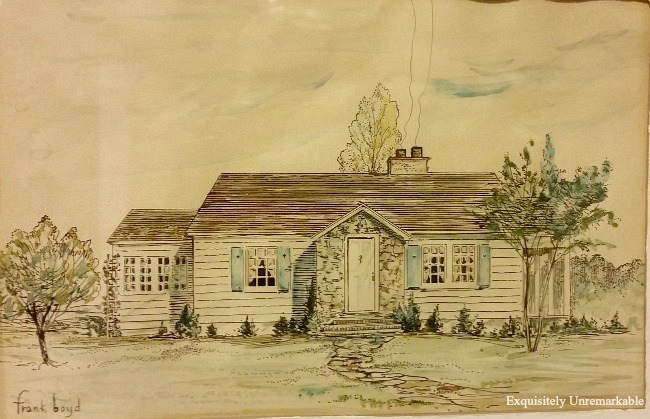 But where did you get the charming watercolor of your cottage? I love it, even with a white door! I also enjoyed reading your 2013 post on a frowning house. Cute! Thanks Dewena!! And I hear you. That storm door was essential for a long, long time. The kids played in that room and I wanted light and I wanted them to be able to peek out...without running out!! I guess it served its purpose for us. BUT...it's still tucked away in the garage in case we ever feel the need to restore it. Your green door sounds like fun, but I'm sure the view of the pups through the glass is even more welcoming! The watercolor is an original work from I don't know what year. It was left with the house when the original owners sold it and the woman who bought the house from them and sold it to us. She then left it in our care. I'd actually love to know more about it and its artist. It's on the list!! So glad to see you in the comments. I hope you're having a wonderful day in your own sweet home! Kim that is one beautiful color and the hardware looks perfect and stands out beautifully against the darker color. Also the stonework is also looking pretty great. I think everything has come together perfectly! Thank you, Mary! I have to say that I'm really happy with the way it turned out. Can't wait to swap out the wreath each season. Cindy, I bet it's beautiful and I bet it looks fabulous and fresh! Enjoy it! Thanks Deanna! I have to say it was worth waiting for! I love it! The hardware is perfect. Well done as always. Thanks Carla! I love looking at it! I love the satin nickel color! It looks great and I love the stone too! Thanks Lisa! I had fun picking this one out. I love the color and new hardware! You surely got an eye for beauty. I also like the newest wreath you have there. Did you made it? Thanks Angela! I actually didn't make the wreath. I stumbled upon it in Tuesday Morning for a bargain price and fell in love on the spot! Lots of work, Julie...we've been here for over fifteen years and it's about that time. I know you get it!! And yes, it's very helpful to have a handy husband. 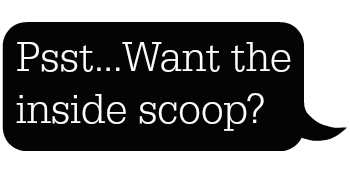 Much more economical than paying a contractor. Wow! that new door handle is stunning with the door and stone. I love it. As a matter of fact my front door is fabulous now that I finally painted it AQUA (with black accents!). Thanks so much, AnnMarie! I think it really does make the stone stand out more now...and I've seen your aqua door. Fabulous!! Kim, this is the second time I have typed this. The first didn't go through and I was so eloquent and flowery with my answer, it was just beautiful! Just like your sweet cottage. I have always loved the inside, as you know, but I don't think I have ever seen the outside. Now my fairy tale cottage (in my mind) makes very good sense. 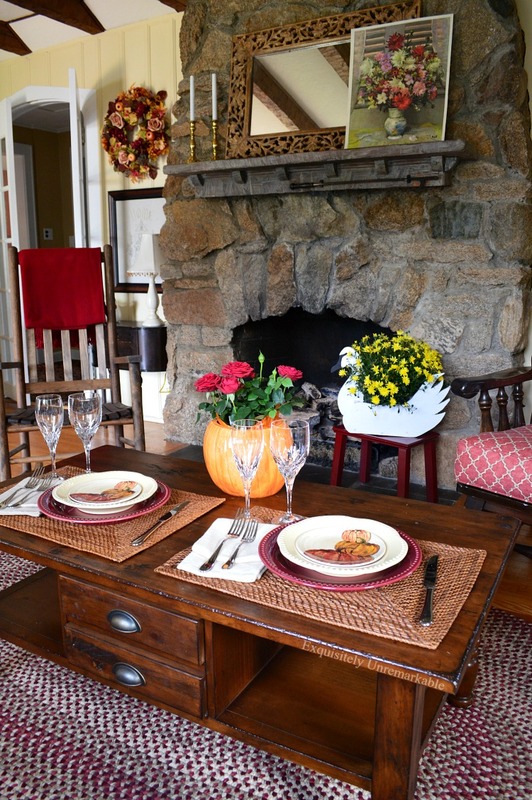 That charming fireplace matching the stone outside. It is all so quaint and beautiful. I have always said the anticipation is almost better the real thing, but 5 years is a bit long to wait for your dream to materialize, which it did big time. I love what you did with the door and the new hardware. A fairytale come true..Happy Weekend..xxoJudy (and this was almost as good as the first answer! Well, my house has antique brick instead of pretty stone, brass instead of satin nickel but yes, I have a black door...three of them in fact :^0. Yours is BEAUTIFUL, and I know how perfect it will be when you do it up for Christmas!!! You two did an amazing job!! Now I can see that I need to repaint mine in order to keep up with the "exquisite" ones!! That wreath is so dramatic against the black door. Thanks Carol! I do like a bit of drama in my decor. YES! It really is FABULOUS now! Thank you so much, Linda! We're really enjoying the look! Well, mine isn’t, but yours is! I bet yours is by now, Doreen!! Hope you're enjoy the new digs! Oh my gosh, that door handle is gorgeous! It goes perfectly with the black door. I love my front door...hubby painted it yellow a couple of years ago (my idea!) and it makes the front of the house (which is boring!) pop. I would love a silver handset like yours, but we have a storm door over the yellow door, and everything on the storm door is gold, too. So replacement silver handles aren't going to be happening until we have to get a new storm door! Thanks so much, Melanie! I have to say I really like it now. The door was an eyesore for way too many years. A hello door sounds wonderful. There's nothing like a bold color to welcome guests!! Elegant and wonderful Kim. Love. Have a happy week. Greetings. Thanks Sandra! It's been fun to look at the after when we come home each day! Wow, that's beautiful. I would never have thought that a door handle could make such an incredible difference to the look. Your front door just screams curb appeal now. I think your front door looks amazing … so welcoming. Thanks Jan! I really do like it! The right hardware really does make a difference. 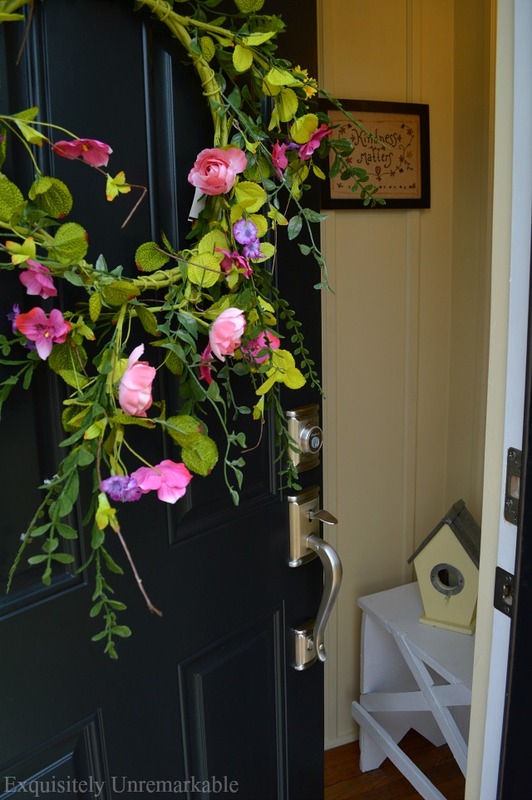 Your updated front entry is beautiful--love the wreath too! It really does make a huge difference, Cecilia! I was shocked at how much...and thanks! It's beautiful Kim! What a perfect little summer project. Thank you Ronda! It was a sweet little upgrade!